In his gallery in the Bövergeest Erhard Schiel welcomed his guests, and in his adress of welcome he reminded one or the other of the first meetings and contacts. Many guests are connected to Erhard as lovers and buyers of his pictures and as friends of the family. Bürgervorsteher Boy Jöns commented on the merits of Erhard Schiel for the municipality, his collaboration with the tourist center, mentioning infinitely many free lectures on the art of erasing. When he took out a book everyone thought of a guest gift, but far from it! The municipality had come up with a nice gesture. Erhard Schiel was allowed to sign into the Golden Book of the municipality under the honorable applause of his guests, the same Golden Book, in which you can find the signature of Erhard Schiel’s “sponsor” Sonja Count Bernadotte who died in 2008. Countess Sonja had invited him to a first exhibition in the castle of the island of Mainau, which became a huge success. In 2003, the second exhibition followed, and in 2012 the third, opened by her son, Count Björn, and again attracted great attention. The new book about the artist Erhard Schiel was presented, which got finished in time for the vernissage of the third solo exhibition in the castle Mainau. On 272 large-format pages, the book gives “insights into life and work”. That Erhard Schiel does not want to retire at the age of seventy was proved by his “birthday picture”, his first large oil painting to the cycle “Nibelungs”. 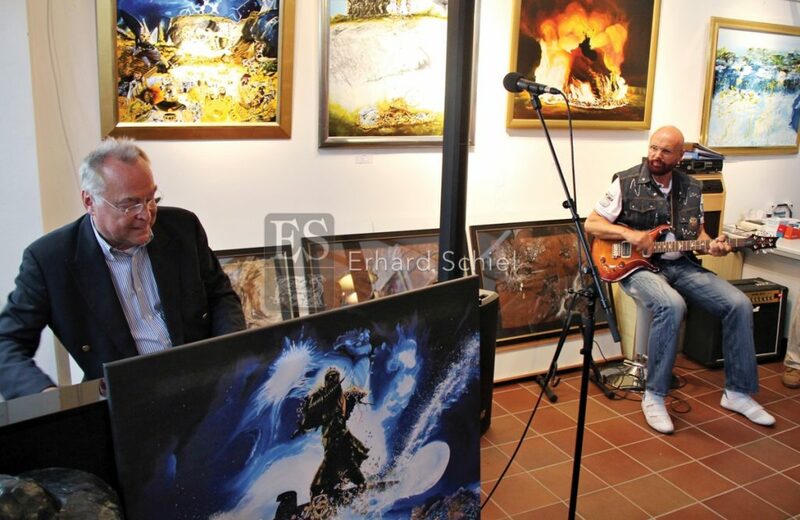 Further paintings followed which were to be shown in September 2012 at the 3rd chamber music day for the music of Eduard Lassen, which set the “Nibelungen” poetry of Hebbel (200th birthday) to music. Since Prof. Gottfried Böttger could not be present on the occasion of Erhard´s 70th birthday, a later meeting took place. At this, the long-time friend gave a personal birthday concert.